4. Valentino Rose Vertigo Tote $2395 via Saks --- This is such a fun feminine bag but if I am going to spend this much money, I might as well buy the classic Chanel flap. Are you feeling blue this morning with me? Which is your favorite? I love that Chanel patent leather tote. Ooh Savvy love the subtle blue in the second Chanel bag though I don't usually love large logos. Do you like the lamb or caviar leathers better? I guess it's softness vs. durability? If I get the great paying job soon, I may get my first Chanel! Hmm, I was drawn to the Rebecca Minkoff Nikki - casual elegance I guess. Oh and yes, I have a US address! Oooo I love #1! And #2! There is a gorgeous blue bag from Aldo that I really want. These are all fabulous, especially the Valentino!! I love that Chanel classic flap! Great picks. I really like the 3rd one! Such beautiful shades of blue! I love that rose tote. I shloud say Chanel, since I'm a Chanel freak, but I'm actually leaning towards numbers three or four. They just seem more my style, with more softer and classier design lines. I like the blue no 5. I love it. I've been obsessed with navy as of late. I'm loving 2, 6 and 8! SG, I am with you on the Chanel classic. Blue is perfect for spring. Rebecca Minkoff is hands down my favorite bag designer. I have several already - a teal one, but not deep blue. Pretty! Love the Valentino rose tote! So feminine and pretty! 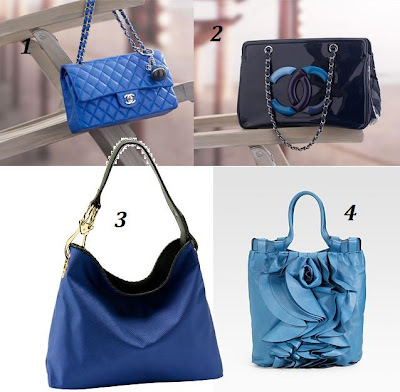 I love bag number 4.
ugh, the chanel bag in that hue is perfect! i def want my next bag purchase of importance to be a kate spade, i love the colors! Ooh, this reminds me to whip out my blue Gucci bag to use...hee hee. Kudos to you for being the only one with willpower! That Valentino bag is divine. The ruffles are so perfect in blue. Everything you have here is very nice! I'll take 'em all, please! I rarely wear blue, but I should fix that. It's such a flattering color on so many people. Gorgeous picks, though the Kate Spade is my favourite. 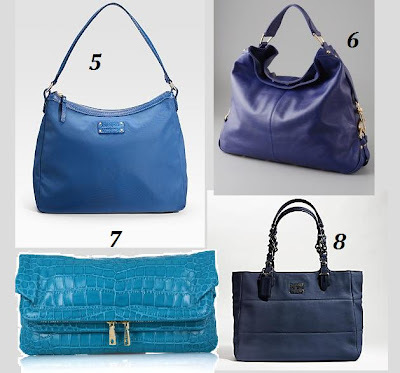 Cobalt blue was all over last season, and it looks like blue will continue to rule this one! Wow...I guess I have to be impressed with myself...not being anything NEAR a fashion person...I recently could not resist the purchase of a bright blue handbag either! All I want for Christmas is the Chanel classic flap bag ;) It is not happening, but a girl can dream, right? I also love that DKNY stamped clutch. I'm not even a Chanel fan normally but I love those first two. awesome! i'm also obsessed with finding the perfect blue bag. I love navy leather this fall. I could've used one of these in my blue post today to go with my shoes and dress!